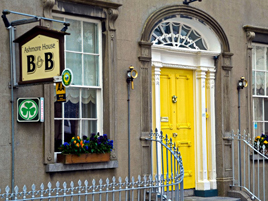 (Bord Fáilte Approved) Ashmore House B&B is the home of Brendan and Laura Ryan who have been welcoming guests for bed and breakfast accommodation for more than a decade. Ashmore House offers guests Private Car Parking Facilities, Accommodation with Georgian Charm, En-suite Bedrooms, Extensive Breakfast Menu, Award winning garden & Internet Access. We'll send you all the happenings from Cashel town including special deals! Our mission is to promote and publicize the many wonders that exist in Cashel beyond the iconic Rock of Cashel. This website is part of our efforts to ensure that people get to learn about the history and many attractions of this wonderful world famous location. Our purpose is to develop the historic town and ensure that people come to Cashel and have a pleasant, entertaining, informative well priced and memorable visit that they would be happy to recommend to friends.